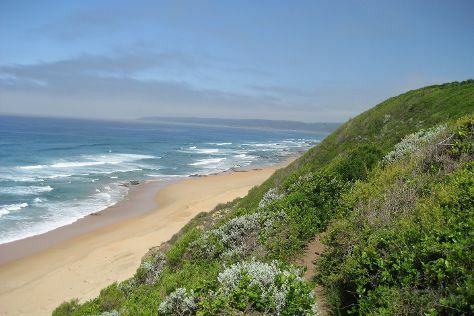 On a vacation in Wilderness, a coastal resort town on the Garden Route, you'll have easy access to a multitude of nature trails and activities set among the rivers, beaches, and forests of Wilderness National Park and Goukama Nature Reserve. Start off your visit on the 5th (Mon): examine the collection at Outeniqua Transport Museum, take in the architecture and atmosphere at Dutch Reformed Mother Church, and then enjoy the sand and surf at Wilderness Beach. To see maps, reviews, where to stay, and other tourist information, read our Wilderness vacation trip planner. London, UK to Wilderness is an approximately 18-hour flight. The time zone changes from Greenwich Mean Time (GMT) to South Africa Standard Time (SAST), which is usually a 2 hour difference. When traveling from London in March, plan for much warmer days and a bit warmer nights in Wilderness: temperatures range from 28°C by day to 17°C at night. Finish your sightseeing early on the 6th (Tue) to allow enough time to drive to Plettenberg Bay. Start off your visit on the 6th (Tue): identify plant and animal life at Lawnwood Snake Sanctuary and then kick back and relax at Plettenberg Beach. To find ratings, traveler tips, where to stay, and more tourist information, read Plettenberg Bay trip builder. Getting from Wilderness to Plettenberg Bay by car takes about 1.5 hours. Other options: take a bus. In March, daily temperatures in Plettenberg Bay can reach 27°C, while at night they dip to 19°C. Finish your sightseeing early on the 6th (Tue) so you can travel back home.